To make a rental booking with Green Motion Glasgow Airport, simply enter your rental location, time and driver’s age and click on ‘Search’ to browse our range. Arriving at Glasgow Airport by air, collect your luggage, as you exit arrivals please call 0141 433 8268 - please be advised once you have called us for your shuttle bus, it can take between 5 -15 minutes for the shuttle bus to arrive. A Green Motion representative will collect you in our Green Motion Shuttle Bus from Car Park 2, Zone D, Car Park 2, this can be found as you exit the main terminal below the multi story car park. Arriving at Glasgow Airport by train, the nearest station to Glasgow Airport is Paisley Gilmour Street, just over one mile from the terminal and connected by the McGill's 757 bus service. Arriving at Green Motion Glasgow Airport by bus, board the McGill's bus 757 at Stance 7 right outside the main terminal building. It runs from 0610hrs to 2300hrs 7 days a week. We are located at the bus stand opposite the Phoenix Industrial Estate, so please leave at this stop. Once you have left the bus, Green Motion is located on the left at Unit 8, Glasgow Airlink Industrial Estate. Please note that charges apply for the bus service. After you’ve safely landed in Glasgow and collected your hire car from Green Motion Glasgow Airport, we know that you will be eager to get your car on the road and start exploring the United Kingdom. If this is your first time driving a car in Glasgow, our advice is to stay calm and take your time. As already mentioned, remember to drive on the left. We also recommend for your own peace of mind to consider hiring a GPS to ensure you can navigate around Glasgow with ease (ask at the rental counter for details). Should you require any assistance while in Glasgow, the UK emergency services can be contacted by calling 999 for police, fire fighters and medical services. For further advice and information on renting a car at Glasgow Airport and enjoying the best offers and discounts we have on offer, remember to get a car rental quote from greenmotion.com. Alternatively you can contact Green Motion's Central Reservation team by calling +44 (0) 2071864000 or by calling Green Motion Glasgow Airport directly on +44 (0)141 433 8268. Green Motion Glasgow Airport are looking forward to meeting your car hire needs in the United Kingdom. How can I contact Green Motion Glasgow Airport? You can contact Green Motion Glasgow Airport by phone on +44 (0)141 433 8268 or by email on [email protected]. How do I get to the rental location after arriving at Glasgow Airport? We operate a complimentary shuttle service. Once you arrive at Glasgow Airport please call us on 0141 433 8268 and we will send a driver to come and collect you from our designated Pick up point. Please wait here until you see our driver who will transport you from the airport to our office. The journey should take no longer than 5 minutes. If you are travelling with anybody who may have trouble accessing the shuttle bus please make us aware so that we can send an alternative vehicle to collect you from the Pick Up point. What personal identification do I need to bring with me to be able to rent a vehicle? Can I make amendments to my reservation? At Green Motion Glasgow Airport we accept all major credit cards including: VISA and Mastercard. Debit cards can be accepted for the payment of the rental but cannot be accepted to be used for our security pre-authorisation. We unfortunately do not accept any pre-paid cards or any payments in cash. We must ask you to note that if we are unable to secure a pre-authorisation of funds against a credit card in the name of the main driver we will not be able to release a vehicle to you. Do I need to leave a deposit when collecting my vehicle? How long does it take to release the pre-authorisation? The pre-authorisation is released by ourselves at midnight on your day of return as long as the vehicle is returned in the same condition. The amount of time before these funds are available to yourself is then dependent on your banking provider as the funds will be with them. Typically most pre-authorisations are released within 7-14 working days of the return date. If you cannot access your funds or you feel that the pre-authorisation has not been released back into your account in the prescribed time period, we urge you to contact your banking provider for further information as Green Motion Glasgow Airport have no jurisdiction in regards to this matter. Green Motion Glasgow Airport offers their rental customers the opportunity to reduce their excess by purchasing one of our excess reduction packages. Each package provides different benefits ranging from reduction in excess to zero excess. Please ask at the rental counter for more information. In the event that your flight is delayed, please endeavour to contact Green Motion Glasgow Airport. In most cases, we monitor inbound flight information and as such we will reserve your car until you arrive for up to 4 hours from the original pick up time. It is important that you make direct contact with the branch if you feel that your delay will exceed 4 hours to avoid us treating the rental as a “no show” and us reselling the rental car. What happens if I arrive/return at the rental office outside of office hours? Unfortunately without prior notice, there is not much we can do to facilitate your requirements if you arrive at our office outside of our hours of operation. If for example your flight is delayed, it is crucial that you establish contact with us and we will advise on whether or not an out of hours service can be offered to you and the necessary fees that will be applicable. On return of a vehicle we do not provide an out of hours drop off service unless prior agreement has been made between yourself and a member of the team at location level. If no prior agreement has been made you must strictly return your vehicle inside of our opening hours when a member of staff is on site to accept the vehicle and the keys. What do I do if I want to complain about Green Motion Glasgow Airport? We take customer service very seriously and would like to think that every rental experience we are a part of is great. 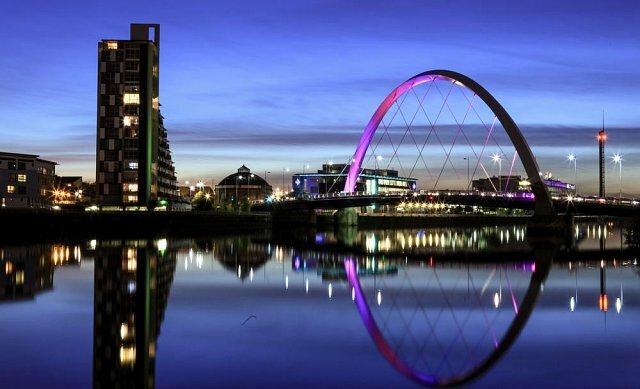 Glasgow, as the largest city in Scotland and the third largest city in the UK (coming after London and Birmingham), is perfectly situated on the River Clyde in West Central Scotland. The city has developed from a small rural settlement to one of the largest seaports in the United Kingdom. Glasgow is known for its Glasgow patter - an accent which many visitors find rather difficult to understand, so be prepared to listen to the locals carefully! The city is culturally diverse and modern, with many hidden gems and historical architecture as well as having a reputation for its art and music scenes. We would recommend that you spend some time in Glasgow's Cathedral and modern Riverside Museum.